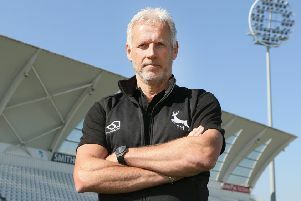 Peter Moores was a frustrated man after Nottinghamshire were denied a deserved win against Kent. Persistent drizzle prevented them from chasing down a modest target in their County Championship day-night match at Trent Bridge. In the hour of cricket that was possible on the final day they picked up the final two Kent second innings wickets, leaving themselves to score just 75 but the wet weather returned before they could face a ball. Moores said: “You can’t control the weather, so it’s frustrating when you get that close and everybody has put the effort in. Anybody that has been in the game for a while will accept that this was just part of it. Adam Milne and Adam Rouse ensured that the unbeaten Division Two leaders were kept waiting, with a stand of 79 for the eighth wicket. Milne, making his Kent debut, was eventually dismissed for 51 and Rouse was last to fall after scoring 35. Harry Gurney returned figures of three for 63 for Notts, with Luke Fletcher and Steven Mullaney each striking twice. Resuming on 214 for seven, after the first session had been lost to the weather, the visitors held only a narrow advantage of 23 as the game belatedly headed into its final act. Hopes of an unlikely rear-guard action had taken a hit with the overnight news that Darren Stevens wouldn’t be able to return to the crease to resume his innings. The 41-year old had been struck on the helmet on the third day and had retired hurt on 31. Milne and Rouse had already extended the contest into a fourth day and they took their stand beyond 50 before Notts took the second new pink ball. It almost brought a wicket straightaway but Rouse was spilled at third slip by Brendan Taylor, off Fletcher. The same bowler didn’t have to wait for long before making amends, to the immense relief of the small band of home supporters who had turned up. New Zealand international Milne, who had been dismissed first ball on the opening day, reached his 50 with a push through the off side for two, getting there from 87 balls, but he drove at the next delivery and nicked behind for 51. In gloomy conditions, even with the floodlights on, last man Mitchell Claydon defied the home attack for half an hour before the innings ended with the fall of Rouse. Having batted resolutely for 142 minutes, the Kent gloveman, changed tack and heaved Mullaney high over the midwicket rope for six. Next ball he attempted a repeat but couldn’t clear Samit Patel on the same fence. Sensing an imminent downpour Notts rushed out Alex Hales to open the batting with Mullaney but before a ball could be bowled the rain returned and the umpires led the players from the field. The draw was an unexpected reward for Kent, who had faced an uphill battle since the first session of the match when they had been reduced to six for three after becoming the first visiting side to Trent Bridge to bat first this season. Nottinghamshire were left to gather just 12 points from a contest that they always looked like winning points and their attention now switches to white ball action and Saturday’s trip to Lord’s for the Royal London One-Day Cup final against Surrey.